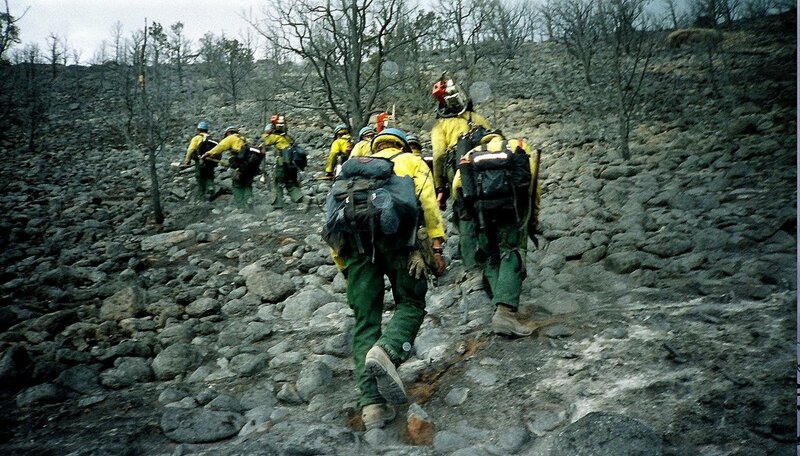 The Sawtooth Hotshots, on the Dixie National Forest. This is another of from the archives of my fire pictures. It was taken in 2004, my last summer on the Sawtooth IHC. It was a miserable fire - grass, sage, and juniper in the desert of southern Utah. My favorite part of every fire, but on these early season desert fires in particular, was the hike out. No matter how tired I was, no matter how much my body hurt, no matter how miserable an experience I had, the hike out always made me happy. The hike out was freedom - knowing my shift is done, that I'll get some food, a chance to take off your boots, a shower, some rest, and then a drive home. Sure there are things I still had to do - clean tools, repair gear, wash trucks, and maybe even a fire call at the last minute. The hike out was peace. I'd drown out the complaints and jokes of my crewmates. Ignore the radio chatter about some far off division. I could think clearly, let my mind wander, daydream of hot food and cold beer, phone calls to my family, emails to my friends. The hike out was hope. Hope for a better fire next time. Hope for some time in the timber and mountains. Hope for lots of OT, a quick summer, and a quick chance to return again next summer. Hope for a job jumping out of airplanes. The hike out was the end. End of the fire. End of the two week roll. End of my summer. End of my fire career. I still miss it, and wonder when I'll ever stop.